This Freebie was paused for awhile, but it's active once again. 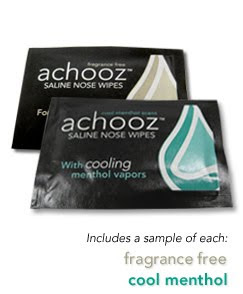 To get your Free Sample Of Achooz Saline Nose Wipes (the company who makes Boogie Wipes for kids) just sign up for there free enewsletter. You'll Receive a fragrance free sample & a cool menthol sample.